Memory foam's ability to reduce pressure points is one of the reasons so many people are using it to get the best night's sleep. 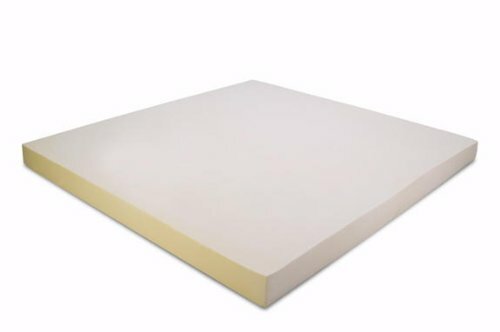 Now you can enjoy the benefits of memory foam without having to buy a new mattress by adding this memory foam mattress topper to your existing spring, latex, or even memory foam mattress. This topper will add comfort and increase the quality of sleep from your mattress immediately. Four inches of five pound density memory foam used in this topper is specifically designed to enhance the feel of your current mattress, and also provides additional support in areas where your mattress may be dipping or sagging. The foam is also specially formulated to contour to your body at any temperature, and will give you the extra comfort you need to get the best night's sleep possible from your current mattress. Environmentally friendly processes used to make our memory foam. This makes our toppers more "green" and eco-friendly, by the use of earth friendly processes. Our toppers have also earned the PURGreen certification, which means they are manufactured, fabricated and packaged in the U.S.A. meeting all EPA and CSPC standards being safe and free from harmful chemicals. PURGreen uses independent laboratory results to qualify products and ensure they are manufactured without the use of ozone-depleting substances such as Chlorofluorocarbans, Polybrominated Diphenyl Ether substances, Harmful Metals, Formaldehyde, Prohibited Phalates or any other unsafe materials. PURGreen also implements baseline requirements such as conserving water, energy and other natural resources in the manufacturing processes established through internationally accepted ISO standards and procedures. ***There may be a new foam smell associated with your new topper; however, this odor is not toxic or harmful passing all PUrGreen, EPA and CSPC standards. MADE IN THE USA. Made in the USA using enviromentally friendly processes. If you have any questions about this product by Memory Foam Solutions, contact us by completing and submitting the form below. If you are looking for a specif part number, please include it with your message.